After when time stops, we move on again. 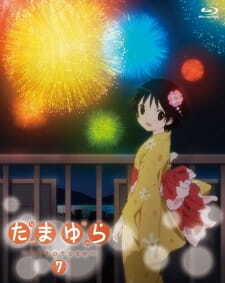 Tamayura ~Hitotose~ was a wonderful anime. It along with OVA's had those amazing heartwarming moments that made your smile or shed a tear. Satou really has a way of making these relaxing anime that leave you filling happy and satisfied at the end. This OVA really does capture that Tamayura essence that the OVA's/Series had. A year ago from this review the TV series began and I right as I started this extra episode and it put me right back to a year ago. I remembered all the characters in a instant and fell back into that Tamayura world that I loved. The plot is really simple, the girls get ready for and go to a nearby festival. Typical festival anime episode but it really shows character development and the struggles Potte went through and how after all the tears and suffering of time being stopped, they moved on. It also shows that even the worst, blurry pictures have meaning and our treasures. Art is typical for the series, nice beautiful, simple. Not the best art style in the world but it works well with the series at hand. Music? Beautiful. The OP still is one of my all time favorite songs. I highly suggest looking it up if your new to the series and have not heard it yet (Also the OVA series's OP is amazing as well). The ED theme was amazing too. The music in this series really is great. It does well in setting the mood for the series from start to finish. In the end... it really makes me want to rewatch the series again. If your reading this and haven't watched Tamayura yet...go watch it. If your not into relaxing heartwarming slice of life anime you should stay away from this but for everyone else when you watch Tamayura you really, really won't be disappointed.